Home » Model Horse	» Meet Yasmin The 3rd 2016 Premier Club Release! Yasmin, the 3rd Model in the 2016 Premier Collection Will be Released Soon! Yasmin is a stunning Shagya Arabian cross sculpted by Brigitte Eberl with colorway designed by Lesli Kathman. She’s a lovely intricate bay sabino and will be shipping in November! I love Brigitte Eberl’s sculpts. To date, Weather Girl has been my favorite Breyer Arabian as far as accuracy. If you are a fan of Weather Girl as well, we have the most current release on the mold, 1752 Rhapsody In Black in stock and available for immediate shipment. But it’s no secret that I have a soft spot for Maureen Love’s Proud Arabian Mare as well. I think Yasmin will take over as my new favorite Arabian. I hope that she turns out as nicely as Breyer’s pictures depict her. Honestly, I don’t think that there is a horse Brigitte Eberl has sculpted that I haven’t liked. 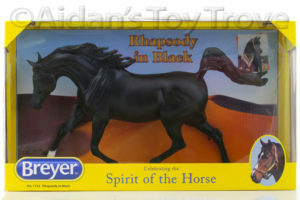 I have a whole conga of Breyer custom Alborozos and a stash of Alborozos waiting for just the right artist to customize them as well. However, I’m down to my factory mint Albys, the thought of customizing them is makes even the diehard custom collector in me cringe. Would there be any interest in my setting up a gallery of my custom finish Alborozos? 3 Responses to Meet Yasmin The 3rd 2016 Premier Club Release! « Breyer Woodland Splendor and Xavier Are On The Way!